Is it really greener and does anyone want to find out? Dark greens have long been campaigning on the environmental evils of disposable napkins but now they’ve gone a step further – reusable cloths instead of loo paper. Wash in hot, dry in the dryer. You may add whatever laundry additives you desire – chlorine bleach, oxygen bleach, tea tree oil, lavender oil, stain remover, whatever. And that’s raises the question – would all the energy, water and the production and disposal of additives requried for the washing and drying be any better for the environment than loo paper? I don’t care what the answer is because resuable bum wiping cloths are several green steps too far for me. Apropos of the previous post: Toilet paper researchers in Winsconsin reckon that if 2 ply loo paper is good then 3 ply will be better. It’s going to be sold to: women 45 and older who view their bathroom as a “sanctuary for quality time”. Any woman with young children will know that not even in the loo can she be assured of a few minutes of “quality time”. And while the quality of toilet tissue is not unimportant, I’d like to think that any women without young children would have many more pleasurable places to provide a sanctury than the loo – be it stocked with 2 or 3 ply paper. 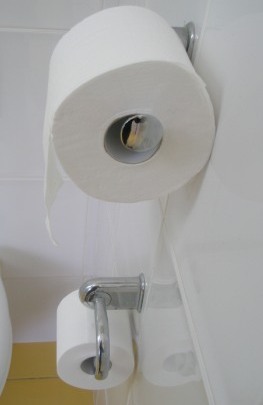 Cottonsoft is selling loo paper rolls which have twice the length of paper as conventional rolls. It doesn’t solve the problem of people who don’t know how to discard the empty core and replace it with a new roll, but it does halve the potential number of times they don’t do it.